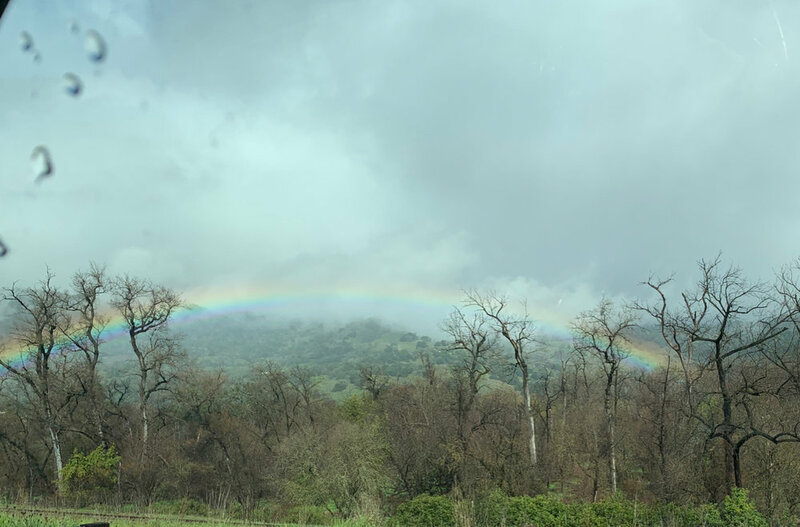 Rainbow on the way to Mendocino. Photo by me. I was a bit down yesterday. There have been shifts in my practice, must be goings and almost goings and those who slip one foot out the door before sidestepping back in. I’ve been blindsided. I’ve had hunches confirmed. I plan difficult conversations that go in unexpected directions and I am simultaneously relieved and unsettled. My work requires me to hold other peoples’ psyches. I carry the ambiguity and ambivalence, the unconscious urges and unexpressed thoughts, for all of us. There is guilt and indirectness. There are hidden messages and agendas. There are my own blind spots and tired places. Sometimes I just want to let sleeping thoughts and feelings lie, even when it is my job to keep them in mind. I felt melancholy and used up. It was rainy and gray and I had work to do. I made a fire because fire soothes me. I worked through it. People will come and go and maybe there are things I could have done and maybe there are not. I pride myself on my faith in the process, on this weird optimism that makes my work feasible. Holding a space, grasping the threads of hope in the fabric of unprocessed experience, feels useful. But sometimes the threads slip through my fingers. They break. They sever. Maybe I was the one who did the cutting. Maybe I was the one who looked away while someone else wielded the shears. I let the emptiness fill me. I took comfort in the fact that I shared this alien, alone feeling with others, the apprehension that there is nobody and we are nobody and nothing is worth anything. That’s a sort of thread, too, a melancholic line so slack that we don’t know we’re woven out of the same loose cloth. I thought of the versions of me across time, the unbearable lonely eras that I bore and now give witness to. I am not alone. I have you, for this moment. And in the moments when you are not here, I will remember you and the time we shared, one mind to another.